Housed in a nondescript red brick building located on a nondescript and dusty street in Karachi, the bustling port city and commercial center in Pakistan, the community space for artists, creatives and entrepreneurs, The Second Floor (T2F), doesn’t look like much from the outside. Inside the space beams with light, color, art, and most importantly space. It was space that motivated Sabeen Mahmud to open up T2F in 2007. It was also the reason she was murdered in cold blood last month as she left an event she had been warned not to host at T2F on April 24. Space is scarce in Pakistan. The few spaces that the country has are the mosque, military barracks, and the cricket field. The ability to assemble and connect with others is the most fundamental basis of any society. Assembly is what drives government. Connections are the backbone of business. The ability to come together to share ideas and interact with others is what helped create Silicon Valley. Silicon Valley happened when not one man but eight men, the “traitorous eight,” walked away from secure jobs at the semiconductor company Shockley Semiconductor Laboratory in 1956, in order to form Fairchild Semiconductor a year later. It happened when Steve Jobs met Steve Wozniak in high school and they shared a love of computers (and music). It happened when Sergey Brin sparred with Larry Page at Stanford University. Silicon Valley and the innovations it has spawned happened with people, conversation, and the experimentation of ideas that were imagined—together. In each of these instances, space – the ability to come together, whether in a coffee shop, a garage, or a dorm room, is what made the difference. Space is scarce in Pakistan. The few spaces that the country has are the mosque, military barracks, and the cricket field. And all of those segregate men and women. Geographically, Pakistan is split along four different ethnic and tribal lines – lines that poor infrastructure and mountainous and rugged terrain further isolates the country’s population. It’s just simply hard to get around in Pakistan. Sabeen wanted T2F to be an open space for all Pakistanis – for men and women and for any ethnic group: Baluch, Sindh, Punjab, and Pashtun. To ensure that it, she established it as a non-profit called “PeaceNiche.” “I took this decision because I wanted to make meaning, not money,” she said. And she didn’t scrimp on the meaning. Sabeen racked up charges on seven credit cards to purchase furniture, acoffee maker, kitchenware, a generator to ensure continued power, books, and artwork for T2F. She convinced a talented artist to paint a mural for the space. 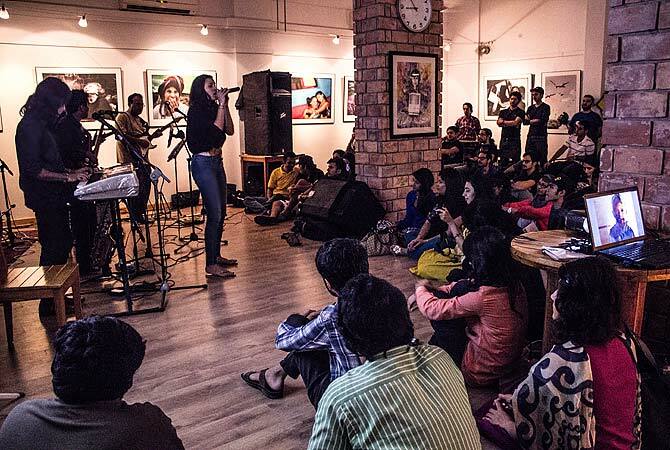 By the middle of 2007, Karachi had a space where artists could meet, poets could read their work, musicians could play on open mic nights, writers and actors could perform their works live, and would-be entrepreneurs convene to share ideas. In 2013, Sabeen hosted Pakistan’s first “hackathon.” Hundreds applied to be a part of it. Sabeen and her T2F team “selected a diverse group of 40 people, including participants with coding know-how, civic planning expertise, and private sector experience.” The goal was to focus on solving Pakistan’s critical governance, civil society, and infrastructure problems. When I met Sabeen at T2F in 2010, she told me that technology was critical to changing Pakistan. I had traveled to Pakistan on a research trip to better understand the country’s startup landscape. More important, she said was space – such as the one we sat in, with its vibrant orange walls, its bookshelves, and sunlight beaming in through its front windows. “Pakistani’s don’t have many places to go, to meet up,” she told me as we sipped our espressos. Nearby there were a few young twenty-somethings hunched over a laptop. “You can’t create – you can’t solve any problem if you’re not collaborating and working together,” she said.